This Diwali, gift your near & dear ones & showcase your hidden affection and joy. Infibeam has brought you a range of such Diwali Gifts that compliments your love for them! Ferrero Rocher a whole hazelnut, coated in milk chocolate, surrounded by ''Nutella'' filling, and encased in a nut croquante. Rochers are individually packaged inside a gold-coloured wrapper. 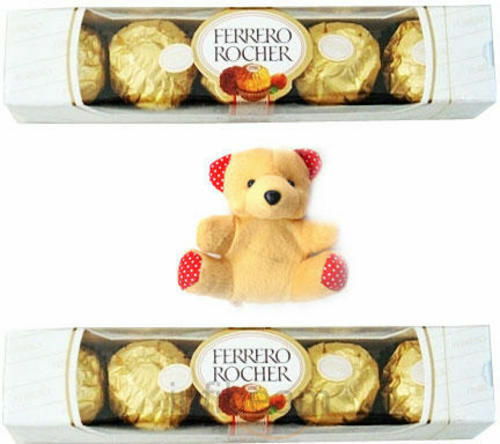 Ferrero Rocher is a popular gift during the Occasions like Birthday, Anniversary, Wedding and any special occasions for your loved ones. Actual product might vary slightly, we always ensure we send you the exact. Our logistics partners will attempt delivery of the items once. Incase the delivery is not executed during the attempt, due to wrong address/recipient not available/premises locked, the customer shall still be charged for the order. Images of the products are indicative in nature, original pack might be different with same product content. I like the infibeam................... it is so good..........and delivery, reply are so fast... the only thing is. to delivery the gift on the given delivery date........................ very good and I had enjoyed..... REGARDS, NIVEDHABUVANESHWARI.